Describe about joint venture for chevron corporation (IOCs) and ttexaco (NOCs)? In the contemporary economic scenario, economists are believed that entering into the joint venture is important to attain success of all oil and gas companies. Entering into an alliance not only concentrates on the inimitable challenges they face in recent times, but also it becomes effectual to sustain in this competitive landscape in the longer term (Mo, 2010). There are several studies that concluded that well-structured as well as efficient joint ventures bring about business-related success which ultimately fulfils the mutual interest. There are also several studies that explained such alliances produce new opportunities for both the participant. However, they also mentioned that in order to attain this achievement both the participant need to make sure that they have the accurate conformity in place (Bartek, 2014). This study has provided specific information regarding the trend of joint venture with proper analysis for the collaboration of NOCs with IOCs. Here, the joint venture between Texaco (NOC) and Chevron Corporation (IOC) has been selected to assess the trend of the industry. The merger of both Texaco (NOC) and Chevron Corporation (IOC) makes the business more strong in producing more energy and power. Aiming to attain more acquisition over the existing natural energy forces it appears to be a bold step. But seems to have some significant reasons. Emergence of other international energy companies, both Texaco (NOC) and Chevron Corporation (IOC) seem to be loosing its strong hold over the market of energy. It also was hampering the the business This joint venture brings opportunity to capture the market and lord over it. At the same time, it leads to the underwater exploration in Brazil, Gulf of Mexico and other place across the globe. Control over North America and North Sea is literally strenthened. At the same time, the power and gasifiction business of both Texaco (NOC) and Chevron Corporation (IOC) is expected to be profited by this marger. Tang (2013) has oberved that Texaco has been sufering from debt in the power business which expects to get fuelled. It also expects to be helpful for overlording on this business. Thi significant combining casts its impact on saving of around $700 million which can be used for more exploration and more escavation works (Phx.corporate-ir.net, 2015). Combining of the workforce is literally significant to bring more hold in the business. Both the companies were suffering from huge financial strengencies which may come to an end. The merger can result of slashing down the costs to at least $1.2 billion. This creates an imense effect of developemnt. After completion of merger, the new company reserved more than $11.2 billion barrels of oil, $77 billion assets and $2.7 million daily productions (Phx.corporate-ir.net, 2015). In the world, the largest National Oil companies are Saudi Aramco, Kuwait Petroleum Corporation, Statoil, Malaysian National Oil Companies, etc (Fedi, 2013). The entire companies of NOCs like Texaco have low technical capabilities rather than the International Oil Companies. With this merger there will be an extensive technical development for both the companies. A broader advantage in the technology is expected to bring an immense output for this venture. In order to access the reserve resources in terms of attaining the competencies of technicality through collaborations is really big deal. The relationship with stakeholders of both Texaco (NOC) and Chevron Corporation (IOC) for last few years was not so much affuent. This seems to have been creating problems for both of the organisations. But with this merger a legitimacy is expected to be retained. Folloing the rules of US Federal Trade Commission, this merger also brings respite for the stakeholders at the same time. Mo and PeÌrez-Deisboeck (2011) argued that the joint venture between Texaco and Chevron take into consideration "an enterprise approaches". As per the CEO f Chevron, it supports them to operate in the lubricants market in addition to its Havoline as well as Delo brands in terms of trading in the international markets. Right at the same time, Moffett and Unruh (2007) rightly explained that with their Caltex international refining along with marketing joint venture, both the organization should shift quickly in fusing their alike cultures, without the disturbance of upstream action practiced in other megamergers. In the energy sector, Chevron Corporation faces challenges for decrease rate of resources regarding production and sales of oil and gas. After merger, Texaco received .77 percentage share of common stock of the Chevron Corporations. On the other hand, Texaco have resources but faces technological challenges in order to modify or increase activities of their own (Beamish, 2013). Joint venture will be the key process or strategy for both Texaco (NOC) and Chevron Corporation (IOC) because it allows partners in committing assets and equity. After joint venture, Texaco exchange the 18% premium ratio of their closing price of share. Apart from that, joint venture strategy also allows the partners in sharing their profits as well as loss regarding costs. According to Nisa Fitriati (2014), alliances of joint venture will allow the partners in identifying the prevalent condition and efficiency in business. On the other hand, exchange ratio represented the $64.87 share for Texaco and Chevron Corporation share more than $84.25 in the exchange ratio. Apart from that, joint venture improves the quality of relationship between two or more organization when they merger and acquisition their business each other. In order to improve the growth rate and make the resources available for business International Oil Companies have to collect more resources from the Texaco in energy sector. On the other hand, in order to improve the technology, National Oil Companies has to take advice from the Chevron Corporation (ChoiChangBeom, 2011). Therefore, the characteristic of strategic alliances such as constant bargaining, multiple decision-making centres, clashes of interests, etc helps in fulfilling their requirement and need. The management control system in Joint venture is also an effective method that helps the partners in managing their resources and share value in a substantial format. Polley (2013) suggested that Joint Venture has three main primary dimensions such as tightness, mechanisms and focus that are multidimensional and complex. According to Prescott and Swartz (2010), partners in joint venture are able to use any of the mechanisms for protecting their resources and share value with each others. In terms of joint venture between Texaco (NOC) and Chevron Corporation (IOC), the control management system properly managed several characteristics such as socialization practices, communications between the parent company, expatriate staffing, delegation of decision making responsibilities incentives of manager performance, etc. Apart from that, Reuvid, (2008) depicted transactional costs of joint venture explain the relationship and structure between the Texaco (NOC) and Chevron Corporation (IOC) hierarchically. Both the companies in energy sector Texaco and Chevron Corporation need for some aspect in order to protect challenges that currently faced. Tang (2013) argued that joint venture is one of the most useful as well as successful strategies that will allow the organizations or partners in achieving greater success on a specific project. It will be the key benefit when Texaco involved new trend of joint venture with the Chevron Corporation. Chevron Corporation share $84.25 cost in their closing stock and Texaco share $64.87 of their common stock. According to Twum (2013), joint venture allows the partners in participating or undertaking the venture without individuals. According to the business aspects of Texaco (NOC) and Chevron Corporation (IOC), joint venture trend allows them in sharing the revenues regarding research and development, distribution and management, administrative costs, supply costs, labor and management costs, etc significantly (DE HEK and MUKHERJEE, 2011). Thus, both the Texaco (NOC) and Chevron Corporation (IOC) can reduce large investment into project. Furthermore, sharing costs also allows both the Texaco (NOC) and Chevron Corporation (IOC) in reaching with per unit costs that may increase efficiency regarding larger production level. In order to improve the business in energy sector, Texaco has required technological resources that helps in producing and selling oil and gas more easily as well as capture the high market share. Texaco share $77 billion asset with the Chevron Corporation after joint venture. On the other hand, Chevron Corporation has required the hydrocarbon resources in order to protect competition. Therefore, involvement of joint venture trend allows both the Texaco (NOC) and Chevron Corporation (IOC) in sharing their collective intangible and tangible resources that pursue their common goals and objectives (Fedi, 2013). For example, joint venture allows the International Oil Companies in taking the hydrocarbons from Texaco and increases their resource level. On the other hand, Texaco will get the technological support from the Chevron Corporation and improve their production system as well as sales. Wu et al. (2013) presumed that joint venture allows the participants in sharing the risks regarding business for developing the new products or distribution system of the existing products. Apart from that, when the organization is expending their business there were several risks. Joint venture with the other companies allows in sharing the risks and decrease the potential challenges regarding business. From the point of view of both the Texaco (NOC) and Chevron Corporation (IOC), there were several risks in accessing resources such as technology, hydrocarbons, etc (Finger and Hoppe, 2014). When both the companies include joint venture trend within their business, they can light the possibilities of risks with the new investment. Asif and de Vries (2014) suggested that joint venture create enough revenue in order to make the development costs for participants. Joint venture trend allows the participants the in sharing the critical experience as well as expertise of management with each other. Apart from that, joint venture allows in sharing the technological capabilities, industry knowledge and other necessitates in business sector. However, if the Texaco (NOC) and Chevron Corporation (IOC) joint venture with each other is considered, they can share the management experience and expertise as well as the technical aspects (Futter and Mo, 2009). For example, after joint venture Texaco is able to get information as well as strategies of Texaco for crossing the borders as well as increase the customer base worldwide. On the other hand, Chevron Corporation gets information about the raw materials and suppliers of hydrocarbons that much required for their business in terms of protecting the competition. Flexibility: The structure of joint venture offers maximum flexibilities in business through developing and creating the work relationship between partners. If both the Texaco (NOC) and Chevron Corporation (IOC) enter into trend of joint venture can involved an M&A transaction for improving the management process during difficult and costly (Genders, 2013). In addition, the structure of joint venture allows the participants in undertaking the growth opportunities during the maintenance of respective business operation in both existing and identities. In accordance to Sivakunako, Buatama and Fongsuwan (2014), joint venture allows the companies in protecting their individual’s profits as well as earning of a venture from the vices studies. From the point of view of accounting treatment, joint venture increase 50 percent more for the participants. Apart from that, joint venture increases the flow of profits, earnings, losses through the financial statements. Lack of experience of joint venture: Law of Murphy is one of the key aspects and useful method when the participants come for joint venture first time. Lack of knowledge in joint venture structure may create difficulties and create potential risk in business (Gutterman, 2009). According to the joint venture trend of Texaco (NOC) and Chevron Corporation (IOC), they have to clear first about the structure and profit margin properly. Moreover, both Texaco (NOC) and Chevron Corporation (IOC) have to build trust with each other. Endless way of joint venture: It is the potential as well as key risk of joint venture in corporate sector. The structure of joint venture develops in a way that never be end. Therefore, after joint venture with the other company means, organization has to share their profits and resources for long time. It not only affects in their profitability but also affect in improving the business. Van Weert (2014) argued that joint venture is as similar as marriage. Once adopt joint venture then it will be long-term process and in a word it is endless process. Therefore, it is not easy to negotiate the deal. However, if the Texaco (NOC) and Chevron Corporation (IOC) joint venture then Chevron have to share the technological aspects as well as the managerial skills or experience with the Texaco. On the other hand, Texaco has to share resources like hydrocarbons to the Chevron. In terms of earning the fess, one party gets more rather than the other party. For example, if the Chevron joint venture with the Texaco, then they have to share most profits more according to their earning and they will be liable for the Texaco (Hiribarren, 2013). It not only affects profitability for Texaco but also make the liable to the Chevron. Unable to get regular financial update: When the two or more parties joint venture one of the participants takes charges for managing financial statement of the company. However, in order to run the business successfully, regular update is very much important as well as the key aspects of measuring the business. However, when the company joint venture, they cannot get regular update (Killing, 2013). They only received the financial update monthly. It may affect in the measuring of business. 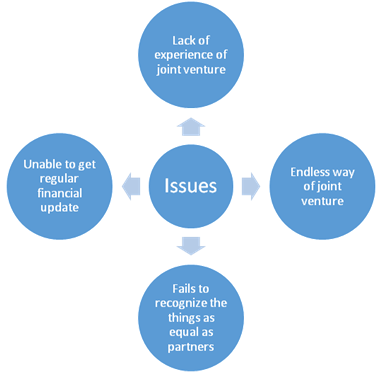 Conflict of Interest: It is also a major issue in joint venture. It has been majorly identifies that when the two or more company joint venture there are huge problems regarding conflict idea. For example, if Texaco (NOC) and Chevron Corporation (IOC) joint venture then they have to consider the for bringing each project. The participants are not allows to start one new project without permission or collaboration with each other (Lorrain, 2014). Therefore, conflict of interest may create difficultly in terms of making good relationship between the participants. Recommendation 1: Make simple agreement: Regarding recommendation for joint venture in terms of business process of Texaco (NOC) and Chevron Corporation (IOC), making simple agreement is required because both the companies enter into joint venture first time (Refer to appendix). Therefore, before starting the work, copyright begins need to be fixed. It can help in make easier the business process that down. Apart from that, making simple agreements, both Texaco (NOC) and Chevron Corporation (IOC) is able to increase flexibility as well as usability in working process. It has been majorly seen that participants misunderstood often about the working process of copyrights. Simple agreement can allow the participants in understanding the copyrights rules and regulations properly. Furthermore, most of cases it has been seen that absence of contract regarding copyrights automatically vests (Mar Benavides-Espinosa, 2012). Therefore, simple agreements creation for new joint venture may protect the absence of contract and defuse the confusion as well as intention of both participants. Recommendation 2: Establishment of clear protocols: The second recommendation is less important over first recommendation because in order to enter into joint venture making of agreement comes first and then come set of protocols. Regarding the joint venture between Texaco (NOC) and Chevron Corporation (IOC), need to establish the clear protocols such as particular activity regarding the aims and role of the business, activity in terms of success, adequate arrangements, etc. Apart from that, both parties should to discuss the activities of joint venture in their first instance (Mardikian PhD, 2009). At the board meeting, both parties have to submit the formal agreement of particular joint venture. Thus, both Texaco (NOC) and Chevron Corporation (IOC) can establish a string relationship between them and also can maintain the intellectual rearward, financial profitability, long lasting relationship, etc. This particular task concluded the factor of joint venture in business especially for the business of International Oil Companies and National Oil Companies in energy sector. The study introduces the reason of joint venture for both Texaco (NOC) and Chevron Corporation (IOC) in energy sector. Apart from that, analyst represented the potential drivers for joint venture regarding business of Texaco (NOC) and Chevron Corporation (IOC). Moreover, after identifying the drives about joint venture in respect to Texaco (NOC) and Chevron Corporation (IOC), analyst describes the key benefits of joint venture in business such as costs sharing, resource sharing, experience and expertise sharing, etc. joint venture is the most effective as well as efficient strategy in business for starting new business or promote the existing business. Through joint venture, companies are able to strengthen their value chain and sharing resources provide more quality service in low price to the customers. Furthermore, potential issues about joint venture also identified by the researcher in this study from the point of view of Texaco (NOC) and Chevron Corporation (IOC). After identifying the issues, analyst describes two recommendations with ranking order along with the proper description. Asif, M. and de Vries, H. (2014). Creating ambidexterity through quality management. Total Quality Management & Business Excellence, pp.1-16. Bartek, R. (2014). Foundation-Industry Relationships - A New Business Model Joint-Venture Philanthropy in Therapy Development. CTMC, 14(3), pp.313-318. Beamish, P. (2013). Multinational Joint Ventures in Developing Countries (RLE International Business). Hoboken: Taylor and Francis. ChoiChangBeom, (2011). The Effect of Joint Venture Partners' Management Control on International Joint Venture Performance. theebusinessstudies, 12(4), pp.159-174. Cots, S. and Casadesús, M. (2014). Exploring the service management standard ISO 20000. Total Quality Management & Business Excellence, pp.1-19. DE HEK, P. and MUKHERJEE, A. (2011). JOINT VENTURE BUY-OUTS UNDER UNCERTAINTY*. The Journal of Industrial Economics, 59(1), pp.155-176. Fedi, A. (2013). Il contratto di joint venture. ECONOMIA E DIRITTO DEL TERZIARIO, (3), pp.403-431. Finger, F. and Hoppe, T. (2014). MicroRNAs meet calcium: Joint venture in ER proteostasis. Science Signaling, 7(350), pp.re11-re11. Futter, D. and Mo, C. (2009). Venture capital, 2009. New York, NY: Practising Law Institute. Genders, D. (2013). The Daily Telegraph tax guide 2013. London: KoganPage. Gutterman, A. (2009). A short course in international joint ventures. Petaluma, CA: World Trade Press. Hiribarren, V. (2013). A European and African Joint-Venture: Writing a Seamless History of Borno (1902–1960). History in Africa, 40(01), pp.77-98. Killing, J. (2013). Strategies for joint venture success. London: Routledge. Killing, P. (2013). Strategies for Joint Venture Success (RLE International Business). Hoboken: Taylor and Francis. Lorrain, D. (2014). « L'acteur lesté » : une joint-venture d'eau à Chongqing. Actes de la recherche en sciences sociales, 203(3), p.30. Mar Benavides-Espinosa, M. (2012). Joint Venture, an Alternative for Knowledge Learning.Knowledge and Process Management, 19(1), pp.1-16. Mardikian PhD, S. (2009). Teva’s Biosimilar Capabilities Mount with its Latest Joint Venture.PharmaDeals Review, 2009(1). Mo, C. (2010). Advanced venture capital 2010. New York, N.Y.: Practising Law Institute. Mo, C. and PeÌrez-Deisboeck, L. (2011). Venture capital, 2011. New York, NY: Practising Law Institute. Moffett, M. and Unruh, G. (2007). Deck's Romanian joint venture. [Glendale, AZ]: Thunderbird School of Global Management. Nisa Fitriati, A. (2014). Urgensi Pengaturan Khusus Lisensi Paten tentang Alih Teknologi pada Perusahaan Joint Venture. Pandecta: Research Law Journal, 9(1). Polley, R. (2013). Parental Liability in Joint Venture Cases. SaarbruÌˆcken: LAP LAMBERT Academic Publishing. Prescott, D. and Swartz, S. (2010). Joint ventures in the international arena. Chicago, Ill.: ABA Section of International Law. Reuvid, J. (2008). Power to the joint venture. Engineering & Technology, 3(3), pp.82-83. Sivakunako, C., Buatama, U. and Fongsuwan, W. (2014). Efficiency of Waste Management in Phuket Province. Research Journal of Business Management, 8(3), pp.294-299. Tang, J. (2013). Joint Venture Formation and Internationalization: A Japanese MNEs' Perspective.Journal of Asia-Pacific Business, 14(2), pp.107-129. Twum, S. (2013). Investigation of a Joint Venture-Ship between Two Firms in Ghana Using Linear Programming. AMR, 824, pp.479-489. van Weert, C. (2014). Flexibele bestuursbesluitvorming in de joint venture. Vennootschap & Onderneming, 24(3), pp.44-46. Wu, T., Fu, F., Zhang, Y. and Wang, L. (2013). The Increased Risk of Joint Venture Promotes Social Cooperation. PLoS ONE, 8(6), p.e63801.